Who gets your vote on that? Spotted the trio in their Indian clothes recently at Amara… While Shweta’s was tacky and Mandira’s was dowdy, it was Juhi who came out on top for us! These days, red carpets are so heavily dominated by western wear, that it is refreshing to see the simple salwar churidar on folks. Don’t blame me, but in a sea of overaccessorized and mismatched outfits, these two look good to me! Juhi Chawla continues her romance with the embellished kurtis, and we actually prefer it that way, because the one time that she did go without the usual, it didn’t go down so well! I think she looks nice in the pink; the gold pants, not so much. 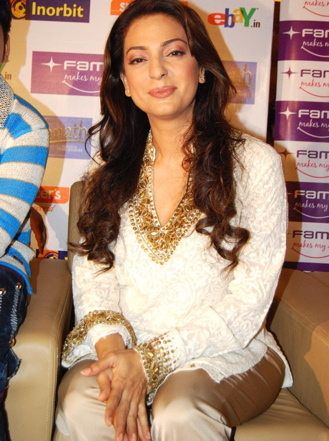 I take Juhi in her embellished printed outfits anyday over this disaster!